The different styles of Trudy. 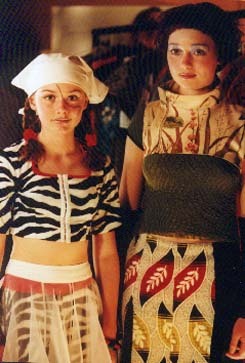 Style #1- This is a pic of Trudy from the flashback episode. Her style is pretty much the same as others but, it works for her. She's wearing a red jacket, red head scarf, white button up shirt, and a black skirt. Her hair is brown, long, and straight. Her make-up is natural looking. Style #3- This is my fav. hairstyle for Trudy. Her hair is still purple and a little longer than style 2 with silver pieces in it. Her make-up blue lipstick and a blue design on her cheek. She has a wool-like half sweater over her grey consistent outfit. Style #5- The Supreme Mother. Her hair is the same as style 4. Her eyemakeup is blue but, not as bright and her lipstick is a pinkish-brown hue. Her outfit is a Chosen-like blue and white rob. Style #2- Trudy the new mother! Her hair is short and purple. She has a little more make-up with red lipstick black mascara and little hearts on her cheeks. Her outfit is not very colorful with greys and blacks. She is also wearing a neaklace. Style #4- The changed Trudy. Her hair is shorter now but, still purple. Heavier make-up with blue eyeshadow and pink lipgloss. Her outfit consists of a green top with a floral design and a skirt with leaf designs. Style #6- Her hair is shorter and black with red highlights. 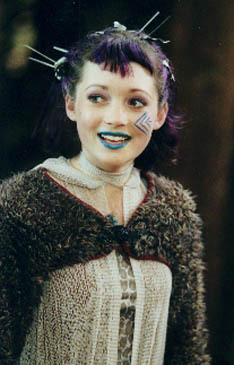 She has blue/grey eye make-up,eyebrow design, and purple lipstick. Her outfit is yellow, red and black.